Register shifts in professional singers may correspond to altered vocal fold vibration patterns which are audible to experts, according to a study published May 3, 2017 in the open-access journal PLOS ONE by Matthias Echternach from University of Freiburg, Christian Herbst from University of Vienna and colleagues. Western classical singers are trained to minimize noticeable changes in the quality of their voices when singing in different vocal registers. Little is known about the vocal fold mechanics when a professional female singer shifts into a new register, a process known as a passaggio. The authors of the present study analyzed the female first passaggio (shift from chest/modal voice to head voice) and the second passaggio (shift from head voice to an even higher register) in 10 professionally trained western classical soprano singers. The singers performed pitch glides, producing notes that gradually got higher, while the researchers recorded high-speed endoscopic videos of their vibrating vocal folds with 20,000 frames per second and the sounds produced. Vocal experts then analyzed the audio recordings and made note of any noticeable register breaks that they heard. Surprisingly, there were pronounced differences across the investigated singers when navigating the first and second passaggi. Utilizing a novel analysis approach, the researchers found several distinct vocal fold vibratory patterns changes: abrupt transitions between the registers, smoother transitions with the space between the vocal folds opened for a shorter or longer duration, and temporary loss of contact between vocal fold. 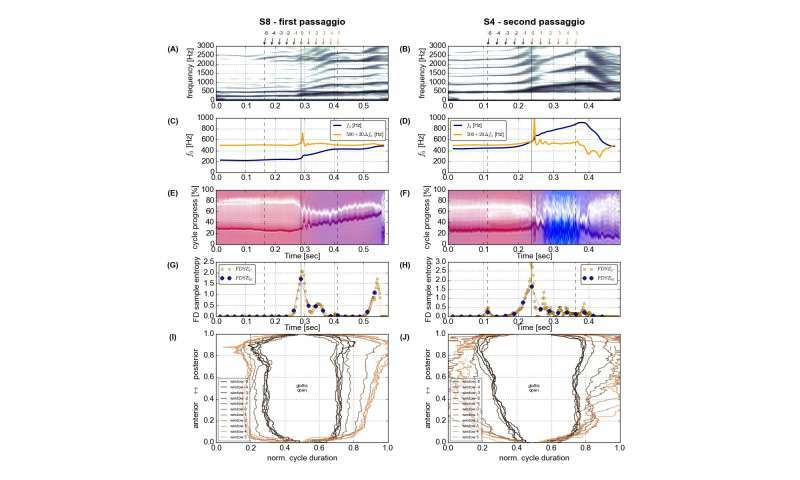 They found that greater variations in vocal fold vibration patterns made both passaggi more likely to be audible to the vocal experts. This study demonstrates that audible register changes are present in even expert professional singers, suggesting that they develop a variety of laryngeal coping strategies to minimize these sounds. The different strategies are hypothesized to be induced by different voice anatomy or differences in vocal technique. Further research could examine these changes among other singing styles, such as musical theater singing, pop/rock singing or yodeling.